We have available by appointment a tour of the ranch and rescued horses to offer friends of the ranch a chance to spend time interacting with the animals and learning more about our ranch and the rescued horses. We would appreciate a minimum $25.00 donation and getting a tour of the ranch using our golf cart. The amount of time available depends on how many volunteers are currently on the ranch, the current workload or current project being done on the ranch. That is why it is appreciated that we know in advance how many is in your group that would like a tour so we can schedule that time and make sure we have available time to spend with you and your group and have the one doing the tour be knowlegible about the entire ranch including history of the ranch and the horses. 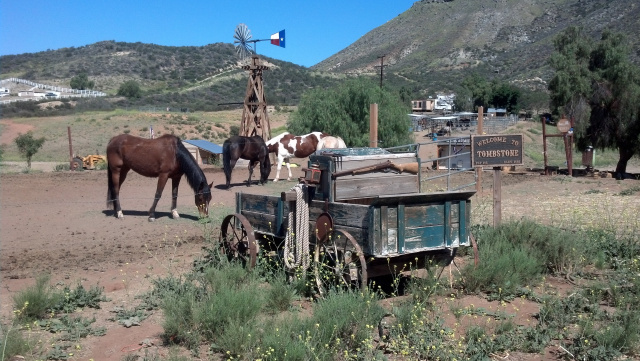 We are all volunteers and some volunteers know more details about the ranch and it's history. Your consideration of this is greatly appreciated. General items to keep in mind for attending any tour. A. We may have rattlesnakes on the ranch during the summer, so ALWAYS keep an eye out while here. B. Bees. We do have bees during certain times of the year. If you're allergic, bring your epi-shot for safety. C. Dress for the weather and conditions. If you leave a hazy San Diego or Orange County morning that is still 55° temp and don't bring lighter clothing, you might overheat. Boots, gloves, hat and jacket are always an asset! D. Bring plenty of liquids to drink. We have lots of fresh well water, but can't provide drinks to match a wide variety of tastes. E. Farm tools and animals can be dangerous for adults, but especially so for children, who need to be strictly supervised for their own safety.